Vermin Scooter Shop: WEAR A @#$%&*#ing HELMET! A 17-year-old boy has died after falling from a scooter at a skate park in northern Tasmania. 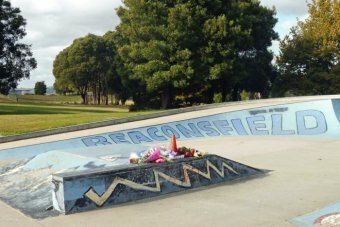 Police are calling for witnesses to the incident at the Beaconsfield Skate Park just before 1pm (AEST) on Saturday. The teenager was rushed to the Launceston General Hospital, but died a short time later. Sergeant Glen Evans said police were investigating and a report would be prepared for coroner. "It appears the male was riding his scooter and has come off the scooter and wasn't wearing a helmet at the time and it appears he's suffered head injuries from the fall," he said. "Police as part of the investigation have already identified three witnesses who are assisting us with this investigation. "If anyone may have witnessed the incident we certainly would like to hear from them at Beaconsfield police station." Kidsafe Tasmania's Jenny Branch-Allen said it was a tragic event and she urged parents to remind children about helmet safety. "From a parental point of view my heart goes out to the family, from a Kidsafe perspective I have to ask, where was that helmet?" She said it was particularly hard to get the helmet message through to teenagers. "They're invincible. They are trying out really difficult tricks these days, they are far more difficult things they're trying to do with these pieces of equipment. "We see them flying through the air and they're following some role models that are doing this professionally these days. "So getting that message through is really tricky. They are at a difficult age, but a helmet will in most cases reduce the injury or prevent death." She said it was up to parents to make sure their children were informed. "It's always important that parents with children at any age talk to them about these things, tell them why it's important to wear a helmet," she said. "Please make sure they're wearing them correctly, make sure you've got that two finger space above the forehead and make sure you've got the appropriate size helmet for your child."